Hello Aspirants, Looking for Territorial Army TA Written Exams 2017 Question Paper, Answer Key, Expected Cutoff Marks, Result Date. TA 2017 exams were conducted on 30th July 2017 in various centers in India where a large number of candidates appeared for the exams. Many working, self employed candidates were seen appearing for the exams which shows many have a vast interest in Indian Army. Candidates who appeared for the exams can checkout their TA 2017 written exam answer key, cutoff marks and result date. Feel free to ask questions on any in the below comments. Time: Maximum time for each paper is 02 hrs and will be conducted in two sessions from 10:00 hrs to 12:00 hrs and 14:00 hrs to 16:00 hrs. Territorial Army Written exams 2017 which was scheduled on 30th July 2017 all over India where large number of candidates appeared for the exams. Surely candidates who appeared for the exams would be excited to check their performance for the exams. So we would be soon publishing the TA 2017 answer key on this page once we get the question paper for the exams.Candidates are advised to check the answers according to the sets of their exams. Go through the answer key and checkout your answers to the written exam. Also their is penalty for every wrong answer you have marked so you need to calculate your marks accordingly. (a) Part – 1. Reasoning - Reasoning will be covering all the topics of reasoning like verbal and non verbal questions with cubes, distance, numbers questions. Thinking questions which you need to think upon such questions would be covered in this part. (a) Part – 2. Elementary Mathematics - Maths Questions from 10th Syllabus would be covered in this Time distance, Trigonometry,Geometry, Simplifications, Profit & Loss, LCM - HCF, Urniary Mathematics, Algebra etc. All the topics would be covered in this. Paper – II. General Knowledge and English. (a) Part – 1. General Knowledge - General knowledge including knowledge of current events and such matters of everyday observation and experience in scientific aspects as may be expected of an educated person who has not made a special study of any scientific subject. The paper will also include questions on history of India and geography of nature which candidates should be able to answer without special study. (b) Part – 2. English - The question paper will be designed to test the candidates’ understanding of English and workman – like use of words. Questions in English are from synonyms, antonyms, reading comprehension, Para jumbles, error spotting, jumbled sentences, sentence correction and fill in the blanks. Qualifying Marks: The candidates will have to score minimum 40% marks in each paper separately and have an overall average of 50% to qualify. For each question for which a wrong answer has been given by the candidate, half of the mark assigned to that question will be deducted as penalty. If a candidate gives more than one answer, it will be treated as a wrong answer even if one of the given answers happens to be correct. Penalty will be imposed as above. There will be no penalty for questions not attempted. The Answer key for Territorial Army 30th July 2017 Exam would be soon uploaded on this page also candidates can check the answer key from the official website of Indian Army by just login on the Official Indian Army website and looking for your SET of exams you appeared for.Check your answer key carefully and accordingly come with marks you score for the exams keeping in mind the penalty for wrong answers. So this was about Territorial Army TA 2017 Answer Key, Expected Cutoff Marks, Result Date. Hope you would have checked your TA exams answer keys. Result for the exams would be declared in 2-3 months span. We would announce the result on our Facebook page once its officially announced by Indian Army. Candidates can checkout the answer key and expected cutoff marks for the exams. We would keep updating with TA 2017 details. 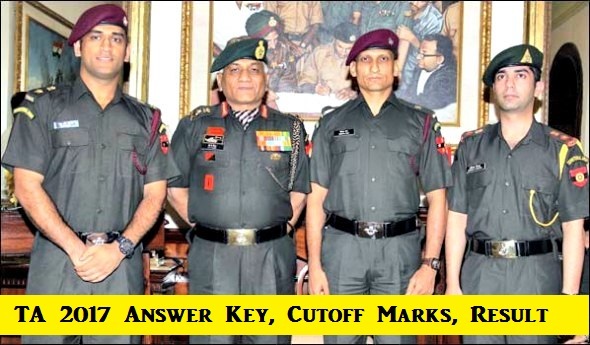 Feel free to ask and queries in the below comments regarding Territorial Army TA 2017 Answer Key, Expected Cutoff Marks, Result Date.